Can HP Turn Infrastructure Solutions Into an SMB Mobility Play? The mobile explosion is causing a major disruption in businesses—and holds the promise of helping SMBs boost employee productivity and customer engagement. SMBs are rapidly picking up on that promise: SMB Group’s 2012 SMB Mobile Solutions Study shows that 80% of small and medium businesses (1 to 999 employees) already use mobile devices and services to support business operations. Our study also reveals SMBs are rapidly moving beyond basic mobile collaboration solutions (such as email, contacts and calendars) to deploy more business applications. For instance, they’re equipping employees with mobile apps such as CRM, time management, expense management and analytics, and providing mobile purchasing, payments, and scheduling apps for their customers. HP StoreEasy NAS Appliances. This is a file consolidation play designed to simplify data management, including the chore of managing the additional data that new mobile applications will generate. HP is positioning StoreEasy as an alternative to continually adding and individually managing new file servers, and a way to improve security, availability, and responsiveness. StoreEasy can be deployed with Windows tools that many SMBs are familiar with, eliminating the need to learn a new storage system. SMB 3.0 provides native file de-duplication conducted at the block level to save space; and secure data encryption to protect application data as it is moved across networks. Pricing starts $5,192 for 8 terabytes. HP StoreVirtual Storage, a virtualized storage environment designed to help larger medium businesses (99 – 1000 users) provision solutions that are re-engineered for mobile access in a virtualized environment. Companies can use StoreVirtual storage to test, deploy, upgrade, and add apps and storage without reconfiguring systems; and to migrate data between virtual and physical locations without taking systems down. Built with HP’s LeftHand operating system and HP ProLiant servers, StoreVirtual Storage supports heterogeneous client and server virtualization solutions. Pricing starts at $11,500. Citrix VDI-in-a-Box with Personal vDisk and HP ProLiant Gen8 Servers is intended to give mobile VDI users more flexibility and efficiency. HP claims the solution reduces image and storage requirements and adds 50% more users per server than prior HP VDI offerings. HP M220 Access Points, to help deploy and manage a wireless network more easily and reliably. The solution enables SMBs to configure up to 10 access points via an Easy Setup Wizard (with a choice of 5 common configuration set-ups). The SMB or partner can manage all access points via a Web interface. Pricing starts at $389 per access point. HP simultaneously announced some enhancements to its “Even Better Than Zero” financing program for SMBs, including a new 90-day payment deferral option. There’s no question that as mobile solutions become more critical to SMBs, they also fuel new infrastructure requirements for management, security, storage and performance on the back-end. 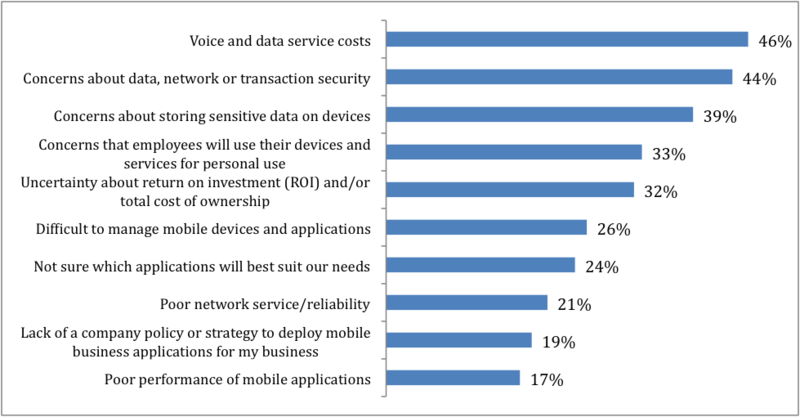 As shown on Figure 1, in addition to cost concerns, SMBs see data, network, device and transaction security, and management as top barriers to moving ahead with mobile solutions. With the rise of bring your own device (BYOD) and consumerization, more types of devices to manage, more apps and more data, these issues will only become more taxing. HP is addressing some of the requirements that mobile brings to the forefront with solutions to help SMBs streamline VDI deployment, more easily provision and manage wireless LAN bandwidth, and enhanced on-premises storage options. But, this announcement does not provide a full picture of HP’s mobile management vision for SMBs–and leaves many questions about HP’s mobile management strategy for SMBs unanswered. For instance, many SMBs would like to offload data storage and management to a cloud provider. What does HP have in this department, and how does it complement these solutions? The announcement also fails to shed light on how HP can help SMBs tackle other key mobility related infrastructure issues, including mobile device and application management, and the need to compartmentalize personal and business apps and data. While HP has put a relevant mobile veneer on its infrastructure story, it needs to paint more comprehensive picture of its full mobile management and infrastructure strategy and portfolio, from on-premises to cloud–along with the guidance SMBs need to figure out which solution(s) will best fit their needs.